In the mythical land of Aztlán, four tribes strive to survive and prosper under the scrutiny of the gods themselves. Peaceful coexistence brings wealth and prosperity to all, but the fearful Aztec gods favor those who are mighty in war and bring to them their subdued enemies as cruel offerings... Only one of the four tribes will be granted the right to stay in this blessed land when the Time of Exile comes, at the end of the Fifth Age of the Sun. Guide your tribe to build the mightiest empire through the Five Ages, win the favor of the gods, and become the greatest ruler in the land of Aztlàn. 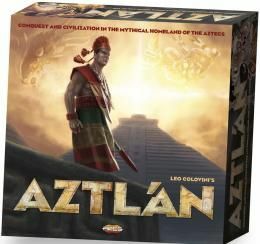 Aztlán is a game with easy to learn rules, deep and engaging strategic game play, and high quality components.